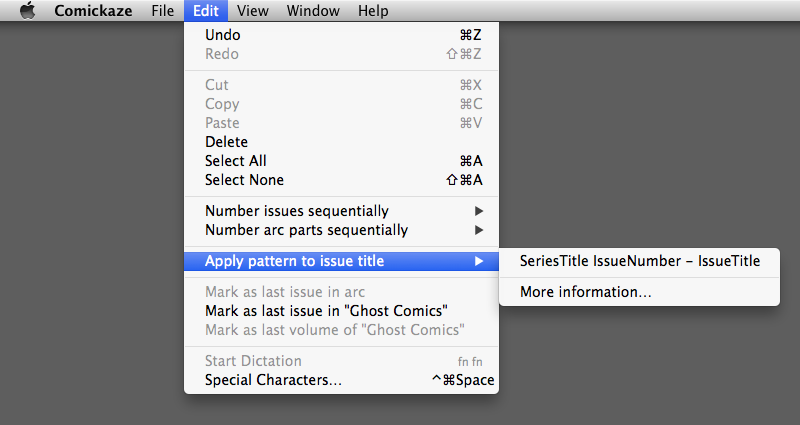 Comickaze allows you to split out an issue's title to the fields that make it up. For example, if you have a comic file named "Amazing Spider-Man 15 - Kraven the Hunter!.cbz", it will get added to Comickaze with the entire filename in the Issue Title field, which means you can't sort by its issue number or group it together with other Amazing Spider-Man issues. Comickaze reads patterns from a plist file, located at the path below (which is inside your Library folder. You can edit it in any text editor, such as TextEdit, which comes on your Mac. Each line becomes a menu item to choose from. Everything in the expression that isn't a field name (listed below) is treated as text to ignore. For more information on each field, check here.